Beginning in 2012, each year Easton has released a bat named the Easton S3. It was the last in line of a speed series they referred to as the S1, S2 and S3. We hit with each one of these bats over the years, and the S3 serves as a single piece aluminum bat in the value space. It is best suited for entry level players looking for a brand name, a lighter swing, some durability and nothing to denote exceptional performance. More specifics of our 2017 Easton S3 Review follow. 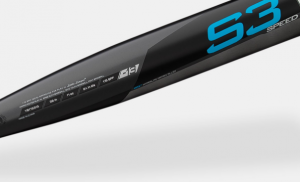 The Easton S3 is an entry level single piece aluminum baseball bat. There are no frills. It comes in non-BBCOR sizes and should be appropriate for those who don’t expect, or necessarily need, amazing production at the plate. Those who want a name brand bat with some lengthy genealogy and good durability will find this bat is adequate. For a single piece aluminum, the bat does have a decent sized barrel. But don’t assume a larger barrel means top shelf production. We simply think the bat is just okay, and anyone looking for a new name brand Easton in the “performance” space will find this the least expensive option. The 2 5/8 and 2 3/4 come in both a normal “Big Barrel” as well as a Junior Big Barrel. The Junior Big Barrel simply has shorter lengths starting at 25 inches through 27 inches. Senior Barrels start at 28 and go through 32. Junior Big Barrel bats are not rated for fast pitch speeds, so don’t be tempted to buy too small a bat to get the cheaper price. There is no difference between 2016’s S3 and 2017’s S3. Both are single piece aluminum bats from Easton’s HMX alloy. Each bat has an expanded sweet spot on an aluminum barrel. Both are light swinging and both are called the S3. Aside from the color up, expect no difference whatsoever. See our full 2016 Easton S3 Review here. Our 2016 review article was called: 2016 Easton S3 Review: Reprinting the 2015 S3. That was meant to imply the 2016 bat is just like the 2015 bat. See our 2015 Easton S3 Review here. In fact, we have not seen real upgrades in production since the 2015 season when Easton upgraded the alloy for a focus on a larger sweet spot. The bat has been largely unchanged since. If you are in the market for a single piece aluminum alloy bat with a focus on a light swing weight, then your options appear endless. We have a hard time thinking of a bat company that doesn’t make something similar, and each, quite frankly, performs about the same as the the next. The 2017 Easton S3, we should note, does not come in a BBCOR. Most others in this class do. Comparable bats are DeMarini’s Voodoo One (review, price), Slugger’s 517 Omaha (review, price), Rawlings’ 5150 (review, price) and Axe’s Elite (review, price). Each is priced roughly the same as the others and each has similar reviews. In large measure, they are the same bat. If you want to read more, check out our 2016 Easton S3 Review as well as our 2015 Easton S3 Review. Easton’s product pages are always somewhat insightful as well as Amazon’s review section. Make sure to check both this year’s and previous years’ reviews as they are the same bats.